Band-Aid Brand Sheer Strips Adhesive Bandages offer comfortable, sheer protection of minor cuts and scrapes. These Band-Aid Brand Adhesive Bandages provide lightweight, breathable protection. The Microvent backing of these sheer bandages, along with the air channels on the Quilt-Aid pad, provide superior breathability. These Band-Aid Brand Tru-Stay Sheer Strips Adhesive Bandages are also made with a unique Quilt-Aid Comfort Pad that is designed to cushion painful wounds while you heal. The Hurt-Free pad won't stick to the wound, allowing for gentle removal. This package includes 40 sheer bandages that are all one size and make for great essential first aid supplies. 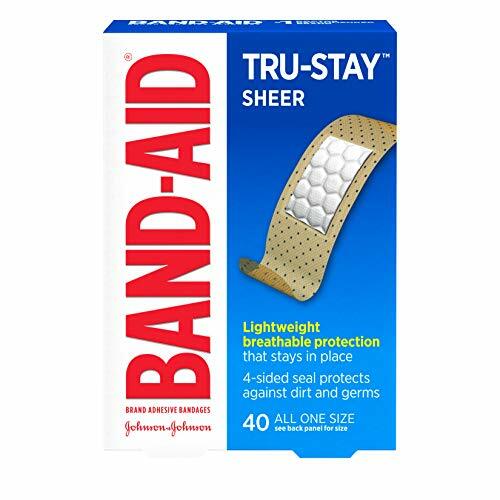 40-count box of Band-Aid Brand Tru-Stay Sheer Strips Adhesive Bandages to help minor cuts and scrapes heal.